A woman who slashed her partner’s arm during a row has been given a community order. Tara Jane Fay, 27, of Rectory Drive, Coppull, Chorley, pleaded guilty to a charge of assault by beating after the disturbance broke out at an address in Chorley on February 24. The court previously heard the dad suffered a cut to his arm when 27-year-old Fay brandished a knife during an argument. The injury was inflicted while there were children were in the house. 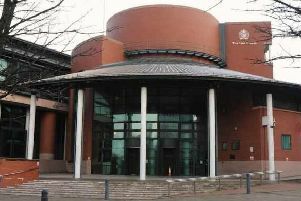 The bench at Preston Magistrates’ Court imposed a rehabilitation activity requirement, along with a £50 fine, £85 victim surcharge and £85 costs after she was charged with, and admitted, common assault. No restraining order or compensation was imposed. Fay was arrested after a third party heard the disturbance and rang police. It is understood the defendant has mental health issues. Almost a quarter of Lancashire’s 13,000 domestic violence reports involved male victims in 2017, with only 2,289 coming forward compared to 7,507 women. 3,424 victims did not specify a gender. Anyone affected can contact SafeNet on 0300 303 3581 or the Mankind Initiative on 01823 334244.